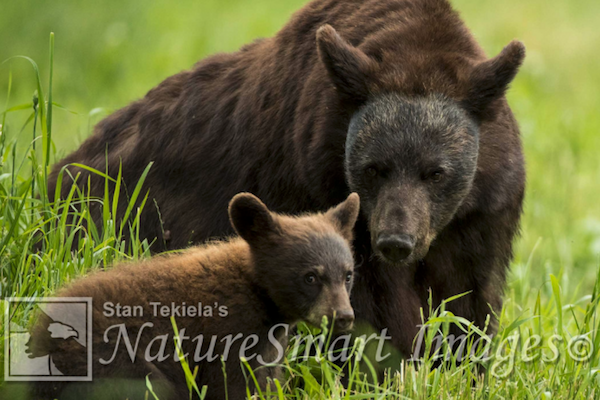 Naturalist and wildlife photographer Stan Tekiela thinks that black bears are one of the most exciting creatures to photograph. Here is his report! Standing in the small open meadow, deep in the north woods, my group of photographers and I were enjoying the early morning calmness. Sunlight streamed through the branches of black ash, and quaking aspen trees dappled the forest floor. A purple finch sang from the top of a nearby tree, and we could hear the irregular territorial drumming of a yellow-bellied sapsucker. Nearly everyone commented about the funny noises the woodpecker made. Then, without a sound, a large black bear walked into the meadow. I have always found it amazing that such a large animal can travel through the woods so quietly. Being able to walk without making a sound is not something us humans are very good at doing. 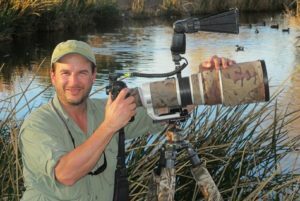 I lead many photo tours each year; on this particular trip, I was joined by six photographers from around the world who came to capture images of black bears—one of the most exciting creatures to photograph. Unique to North America, the American black bear (Ursus americanus) is not closely related to our other two bears, the brown bear and the polar bear. There are eight species of bear in the world: the American black bear, brown bear, polar bear, Asian black bear, giant panda, sloth bear, sun bear, and the spectacled bear. 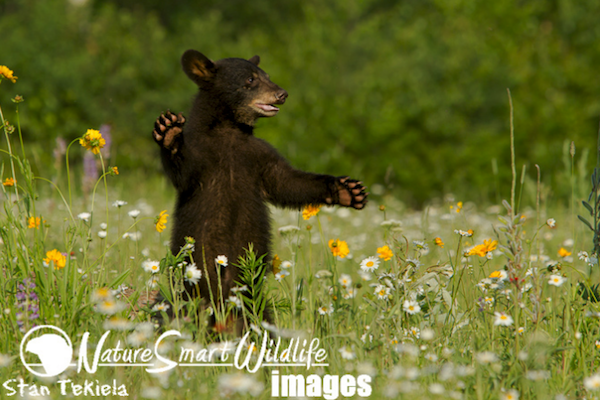 The American black bears are the smallest of our three bears in North America, but they are the most widely distributed. Black bears are found in good numbers from Florida to New England, all across the northern states and down into the Rocky Mountains. Small populations even extend down into Mexico. They are also found throughout most of Canada and Alaska. 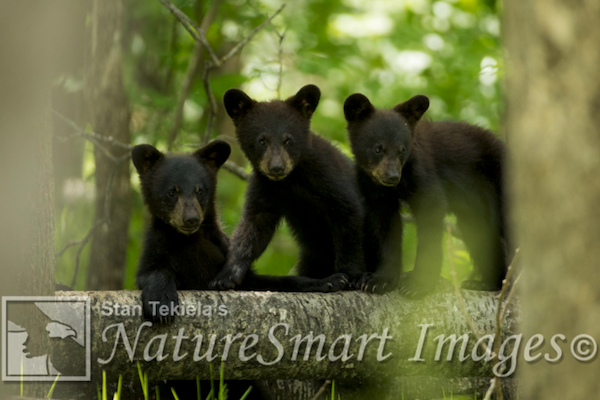 During my bear photo tour we were lucky to have a mother with five spring cubs. Black bear females on average have two to four young, but, occasionally, they have as many as six. Mating season is in June and July. Male bears, called bores, wander the woods, following their noses and looking for receptive females. The females need to be at least three to five years of age for breeding, and then they only mate every other year because their babies take nearly two years to become large enough to be on their own. After mating, the female, called a sow, doesn’t become pregnant right away. Bears have a unique reproductive system in which the fertilized eggs stay in a suspended state until autumn (November). At this point, the number of eggs that will implant into the mother’s uterine wall depends upon her overall health. If she has enough fat reserves and is in good overall health, more eggs will implant and start to grow. If she didn’t get enough to eat and is low on fat and is in poor health, she won’t have any young at all. Baby black bears are born in February while the mother is still in the winter den. At birth, the baby bears’ eyes are still closed and they weigh only about 1 pound. They are only about 8 inches long and are covered in a fine black hair. They are completely dependent upon their mother. They don’t open their eyes until they’re nearly 40 days old and will feed on their mother’s milk for up to 30 weeks. What I find totally amazing is how the mother communicates with her young. At this time of year, the young “spring” cubs follow their mother around. With just one sound from their mother, the cubs scramble up the closest tree and will stay there until she calls them back down. Often she will “order” her cubs up a tree and then wander off to find something to eat. She can be gone for several hours. The cubs are vulnerable at this stage, so it’s important for them to remain up in the tree. When the mother returns, she stands at the base of the tree where her cubs are located and grunts a soft sound. The babies file down, one by one, and join her on the ground. Twice we watched as a mother returned to collect her single cub. She called and called to the cub, but the young bear refused to come down. 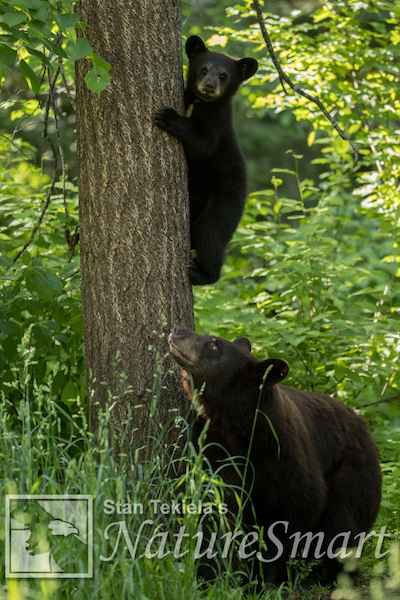 You could see the frustration in the mother as she circled the base of the tree over and over, looking up and calling. But nothing was making the cub come down. Suddenly the mother started climbing the tree. When she reached her cub, she grabbed the baby by the scruff of the neck and pulled very hard. She did this several times, once nearly knocking the cub out of the tree. She climbed back down the tree and called again. This time the cub listened and reluctantly climbed down and followed her off into the woods. We felt lucky to witness such an interesting interaction between mother and cub.